Jesse Folk stopped by Listermann Brewing company in Norwood to talk about the recent hazy IPA craze. Listermann has become Cincinnati’s top spot for NEIPA style beers, knocking out one to two releases a month of either new NEIPAs or variants. Brewing Porters & Stouts: Origins, History, and 60 Recipes for Brewing Them at Home Today is a new book out by Terry Foster offering and in-depth look at porters and stouts. Like my last book review, of Farmhouse Ales, this book offers a very thorough look in a very narrow field. While the book does talk a fair bit about stouts it’s got a stronger tilt toward porters. Still, if you’re a lover of porters or stouts it’s worth reading, especially if you want to master brewing them at home. The following is a complaint about many books involving brewing history: I don’t know why so many books do this when covering beer history, but it gets tedious to read. It doesn’t really add much to the overall story of porter/stout development but does show, somewhat, the extent to which breweries were making these beers. I really don’t enjoy reading these paragraphs of facts. But enough of that rant, back to this book. Now we move into a breakdown of the plethora of sub-categories of the porter and stout styles. Flavor, aroma, malt bills, ABV, original gravity, and commercial examples are available for every style. Something interesting Brewing Porters & Stouts does that I haven’t seen before is the IBU/OG ratio. Instead of saying exactly how many IBUs a style should have it lists the number of IBUs in relation to the OG. So if you have a starting gravity (aka original gravity, hence OG) of 1.040 and an IBU/OG ratio of .5 then you should have an International Bitterness Unit (IBU) level of 20 IBUs. Why the author doesn’t just come out and say 20 IBUs I’m not exactly sure of, but it’s still a cool system. Now we get to the real meat of the book. However, this is where anyone who doesn’t brew yet will lose interest. From here on out it’s all about bringing these beers to life. Beginning with wide coverage of the different malt varieties used in porters and stouts, along with what flavor and color contributions they add plus what percentage of the grist they represent. While the malt coverage is great the hops, water, yeast, and finings coverage is as basic as the first few pages of any introductory homebrewing book. If the malt section was wide then the recipe section is massive. 63 pages of recipes for every kind of porter and stout imaginable. Sure, all you need to do to find a homebrew recipe is spend 10 seconds Googling but this book provides a repository of recipes that is nice to have on hand. FULL DISCLOSURE: I reached out to the publisher who was kind enough to hook me up with a free copy. To our readers, and any companies interested in sending me stuff, giving me free stuff impacts the review in only 2 ways. That I will do my best to review it in a timely fashion and that and I will write a blog post about that review. Giving me free stuff does not guarantee you a favorable review or that I will tell everyone to go buy it. This post is in direct response to Andy Crouch’s article “The Futility of Beer Styles” in this month’s (October 2013) Beer Advocate magazine [Edit: Andy has made me aware that this was only part 1 of 3 and these concerns will be addressed in future parts. A fact not mentioned in the magazine]. If you haven’t read it yet then I won’t fault you for reading it before continuing this post. However, if you don’t get Beer Advocate magazine or don’t want to wait then the quick summary is that he advocates for discontinuing the use of beer styles. Without beer styles we couldn’t have awesome posters like this! 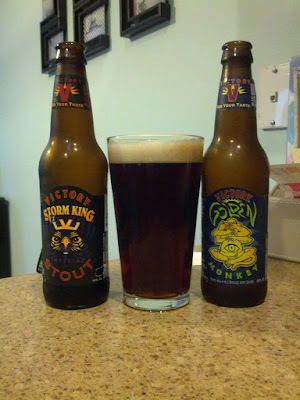 After my recent post on Victory’s Storm King imperial stout the comments on reddit brought to my attention a delicious idea I’d never heard before. Turns out that at the Victory brewery you can order a beer called a Silverback, now you won’t find this on any store shelves, it’s a mixture of half Victory Golden Monkey and half Victory Storm King. The white head from the Monkey on top of the black body from the Storm King give this brew it’s Silverback name. I’ve had a black and tan before, Guinness stout & Bass pale ale, and quite enjoyed them. However I have no idea what to expect from a stout and a Belgian tripel except for one thing; both of these beers are over 9%,so I will be drunk! I poured the Golden Monkey first and ended up using a bit more then half of that before I got to the Storm King. I’d read that this didn’t separate this well like Black & Tans so I tried a trick and poured the Storm King on a spoon over the Monkey, as you’ll see it didn’t layer well either. Very interesting appearance for sure. Kind of a dark brown or purple color beverage with a milky white head with streams of brown from the Storm King. Woah, pungent aroma with plenty of roasty malt action as well as some flowery hops. Oh and a strong dose of alcohol. Taste is curious as well definitely picking more of the stout here then the tripel. Strong malt body and taste with citrus and pineapple hops not found in any other stout I’ve encountered. Hints of chocolate, caramel, orange peel, and lots of “zest”. Holy carbonation Batman! I’ve had fresh soda flatter than this, man those are some tingly bubbles, all riding atop a smooth medium body. This has to be one of the most interesting beers I’ve tried. Not nearly my favorite by any means but most interesting for sure, no style has ever come close to this menagerie of taste and flavors. They’re good and all but not great, and that carbonation is a little over powering. This is certainly worth a try just bring a friend to split it with. Remember what’s interesting isn’t always the same as what’s good. CHOCOLATE OAK AGED YETI IMPERIAL STOUT is another revered incarnation of our legendary imperial stout. We toned down the hops a bit to allow cocoa nibs to contribute some pleasing bitterness, while vanilla notes from the oak combine with the cocoa to create an aroma and flavor akin to a gourmet chocolate bar. A dash of cayenne keeps things lively, adding just a bit of heat to the finish. Another great Yeti? Hell yes.